How do Amish women wash clothes? How do the Amish do the laundry? Some might imagine that they use water from running streams, or some other “natural” method. In fact, Amish use a mixture of technology and nature to clean their clothing. If you visit an Amish community, it’s likely you will see the ubiquitous clotheslines, sometimes stretching high up into the trees, hung with pants, shirts, and dresses of various colors. This iconic image of Amish society is the result of decisions made collectively by the Amish to forgo the use of public electricity. The job of doing the laundry falls to Amish housewives, a standard task of running a household. Amish homemakers often have a scheduled day of the week on which they try to get all the laundry done. In some communities, this may be the same day of the week for most or all households. On Sundays, Amish do not do housework or tasks other than indispensable ones such as milking, and Saturdays are often spent preparing for church the next day, which may involve washing buggies or cleaning a home. Often laundry day falls on Monday. Doing laundry for a large family is a lot of work. Since the Amish average 6-7 children per family (Some families may have 8-10 or more), and since clothes get dirty quickly on the farm and in the manual trades Amish pursue, soiled clothing can pile up quickly. Fortunately, the Amish housewife has a piece of technology to help her in this task. The vast majority of Amish housewives use the classic wringer washers, once popular in the post-war era in America. These are used as they are of a simple design and able to be adapted to take into account Amish technological restrictions. Since Amish do not use public electricity, how do they power washers? Most Amish get power for their washing machines from a diesel generator, which is typically used to generate electrical power or to drive a pneumatic (air) motor. This can involve a good bit of noise and hassle, but is a tangible example of the Amish compromise over electricity. To get all the laundry done may take a few loads. Amish-run washer businesses exist in many of the more sizeable communities, where Amish sell and repair these typically Maytag-brand washing machines. This is another example of a seemingly archaic business, like those making horse-drawn equipment or carriages, which has survived and flourished in Amish society even while it has died in the surrounding society as the need for its services has disappeared. How do Amish dry clothes? Adding to the Amish housewife’s workload is the fact that Amish do not use mechanical dryers (though some Amish use “spinners” which spin water out of clothes to make the drying process go faster). Thus the Amish use the traditional method of hanging clothes out to dry. Nearly all Amish yards will have some form of a clothesline. Some of these are the typical “T” clotheslines that hang clothes at eye-level. Another interesting innovation, created by an Amishman, is the spool that allows a long line of laundry to be strung from one point near the home to a second point high up in a tree or on the side of a barn. The Amish housewife turns the crank to bring the double-lined clothesline in and out. Thus many clothes can be hung without tying up space on the lawn (which can be in short supply in some settlements). Using this classic method of drying clothes means being at the mercy of the elements, of course. Rainy days prevent hanging clothes outside. Some Amish hang small batches of clothes underneath overhangs or even in enclosed porches when rain threatens. Amish may sometimes be spotted in local laundromats, doing small loads of “emergency” laundry, when there is not enough time to dry or if weather conditions do not permit it. 17 responses to How do Amish women wash clothes? I used to help my grandmother wash clothes on a Maytag wringer washer. I thought it was a lot of fun. Her Maytag was in the basement. She used a stick to fish the clothes out of the rinse tub and then I was allowed to feed it into the wringer. 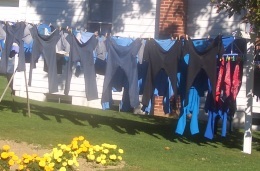 Then we hung them outside on the line to dry. I loved the smell of the dry clothes when we took them in. There’s nothing better than sheets that have dried on the line! I have 6 kids it seems like I am always doing wash. It is never ending. I so admire these ladies. It is 9:00pm and I just put a load in. 3 of my kids do their own but itis still never ending. I assume the Amish use cloth diapers…just assuming that if they do, there is NO way a mother can wait a week to launder cloth diapers, nor ever have enough to go an entire week…Are exceptions made to add to the laundering ‘allowed days’ when there is a baby in the family who’s diapering & clothing needs must be attended to several days a week? Also, does anyone know what type(s) of cloth diapers they use? Might it be the cd’s of old, like flats or prefolds with pins (or snappis) & plastic pants, or more modern cloth diapering methods like fitteds & snap or velcro covers. @Nicole – Though some Amish mothers do use cloth diapers, many use disposables as well. Mostly what I saw in living in Lancaster county, they will use any diapers and diaper covers, as long as they’re plain. I saw many heavy prefolds with white Bummi style covers back then, but if all they could afford was plastic pants, then that’s what they used. But you wouldn’t find any cute prints on those covers. And laundry isn’t really “restricted” to Mondays – it’s just that it’s SUCH a heavy chore that it’s traditionally tackled after the day of rest, Sunday. If they have a diaper emergency, they do more laundry. At least, that’s how I heard it! Thank you Kelly for your reply/answers. I really wish there was a benevolent ministry for the Amish that I could donate to because I have found that so many non-Amish mommas that I have given cd’s to, even after marking cdf on them, have been dishonest & will try to resell even when they are not supposed to! These are Among many other items that I’d like to donate to a group of folks such as the Amish that I know are honest & would only take/receive items that they would use. Funny you should say that – I sew CDs to donate to Morning Star pregnancy centers. I figure that way they’re the ones who decide who gets what. And besides, while my diapers are serviceable, I doubt they’d sell well since the absorbent parts are made from old t-shirts, so I don’t really worry about that! 🙂 Giving Diapers, Giving Hope is a nationally recognized cloth charity, and they distribute cloth diapers to applicants. What is ‘Morning Star pregnancy centers’ ? I actually had a thought immediately after I commented about maybe just contacting an ‘Amish friendly’ midwife &/or birthing center about donating directly to them & let them gauge the needs of their clients & they could distribute them as they see the needs. Amish women actually wash every 2 to 3 days and they can do 5 or 6 loads in about 2 hours or less so it is faster than using a washer. They use what’s called “blueing” in the wash water to whiten whites and also bleach. Also most women use snaps on their dresses but I’m pretty sure if men had to use snaps or pins for their pants they would not be strong enough to hold the pants closed when they are working. We are not Amish, but when I was young our water was spring fed. So. . no water pressure to speak of. A wringer washer was a necessity. Ours looked just like the one pictured on our Facebook pages. I used to get scared when I got something caught in the wringer and it became all wrapped around in there, but my Mom seemed to always be able to save the day. Pictures of these washers give me nostalgic feelings about “home” now. a) If a man can use electricity in the barn/shop as needed, why isn’t the woman allowed the same level of electric usage in her “workplace”? b) For those orders who pin their dresses to wear, do the men pin their trousers closed? I almost feel I have seen an answer on this in another blog. Please feel free to direct me to one if applicable. Not meaning any disrespect, I’m coming more from the Biblical standpoint that Christ died for His church so the Christian head of house should want the best for his wife, even more than he’d want the best for himself. Carolyn in answer to a), that is an interesting point, and you might find Amish women wondering the same. I think the rationale is really that men need the higher levels of tech to make a living in a changing world and economy, while women in the home can get by with less. That’s a generalization but probably some truth there. Also, the home is seen as more sacrosanct in terms of allowing the world and its gadgets in. So you’re going to see the highest levels of tech in shops and off-site work places. b) The broadfall trousers are closed with buttons. Thanks for the answers, Erik. Re: broadfall trousers — what’s sauce for the gander is sauce for the goose or shortened to “what’s good for the gander is good for the goose”. If men are allowed buttons, women should be allowed buttons. I understand about the home being sacrosanct from technology. But some things would change quick, I believe(jokingly 😀 ), if the husbands had to do all the housework. I know how amish women do their laundry, but I wonder how they keep all the whites SO white ? Would love to hear their secrets. Clothes are washed in HOT water. I mean boiling hot, at least when you wash the first white load. With a wringer washer you proceed to darker loads of clothes ending with washing the scatter rugs. By then the wash water looks like sludge. A wringer washer gets clothes cleaner than an automatic. My Quaker mother has used one all her life and still does after 55 years of marriage. You add washing soda or borax to the water, this helps get things clean. Then white clothes are bleached. Bluing is added to the rinse tub water in the second tub or final rinse. Bluing makes yellowed clothes appear whiter. I often wash my clothes in the bathtub and dry them by the window in my apartment. Am I out of touch or are clotheslines passe? Back in the day even people with dryers used them. Big deal. I find it strange that if a certain piece of technology is allowed with amish they all seem to use it. A generator for electricity? Is that not electricity? And it pollutes. I hope one issue they will not compromise on is tv, though I find it very odd that I never read a story about an Amish person being shocked by what’s on it when they have been exposed. Maybe they haven’t seen it, because I would be shocked, for sure. Maybe they aren’t shocked because they see the same behind their own closed doors! Leave a reply to How do Amish women wash clothes?